It was a lovely day for Amanda's shower. The weather was perfect. Not too hot, not too cold. Here is the smiling bride with her new knives. Everyone loved the cones that I made. I hung them on this cute iron tree that I found. Here is Amanda with her friend Jackie. Jackie is one of the bridesmaids. Amanda and I. We are actually the same height, but my heals were higher today. Aren't those the cutest containers for the lemonade, water, and ice tea?? Chocolate fountain, need I say more? Amanda and her Nana. (my mom). Hope you enjoyed these scenes from a wedding shower. A fun time was had by all. Amanda had a great day, and got a lot of lovely gifts. Thanks everyone, especially Jen!! Good job with the shower!! Tomorrow is my daughter's wedding shower. It is being given by her friend, and bridesmaid Jen. Her Matron of Honor lives in Ohio, so Jen took over as party giver. Thanks Jen!! Just thought you would like a sneak peek at the favors that I made. The colors of the shower are brown and blue. I made 25 of these little cones. They are holding brown and blue Jordan Almonds. I will take plenty of pictures at the shower tomorrow, for you all to see. I will post them on Saturday night or Sunday. Hope you are having a great Friday!! Flea Market find and Romantic Country Magazine!! Hope you are having a good Wednesday. I thought you might like seeing another flea market find from Sunday. I got this beautiful throw/quilt. The colors match my home perfectly. I bought it from my friend Karen. She sells at the Ventura flea market. I thought it looked cute thrown over my bench in the living room. Now for extra exciting news!!! 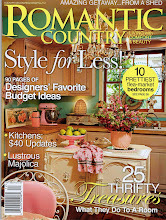 Run, do not walk and pick up a copy of the new Romantic Country Magazine. My friend Jennifer Grey from http://www.theoldpaintedcottage.com/ is on the cover. Her beautiful home is not only featured in the magazine, it actually made the cover. She kind of kept it a secret. If you read her blog yesterday you already know. I read the article last night. It's great, and the pictures are fabulous. Today is one month until the wedding! OMG!!! Look at all the wonderful things she sent. It was so much fun to swap with her. She is a very talented girl. Thank you so much Michelle!! I also wanted you to see my new little addition to the Halloween collection. I picked up this cute papier mache jack-o-lantern today at the Ventura flea market. They usually don't come with the paper insert still in tact, because they would burn from the candle inside, like the one I have on the right. I got a pretty good price considering how old it is. It was a good day at the flea market. I will show more soon. I thought you might like to see another glimpse of Halloween at my house. Here are some antique Halloween postcards. My front door wreath. One of my favorite black cats. The Boo! banner that I made. My hutch all decorated. My fireplace and mantle. I even decorated the little bird house near my front door. One of my prize pieces, this papier mache jack-o-lantern. These are hard to come by anymore. If you find them, they are really expensive. The Games for Halloween book, is from 1912. Halloween parties were big back then. (What else did they have to do)? Now for the news, I will be featured for the second time as the Cottage of the Month for October, on Jennifer Grey's website, http://www.theoldpaintedcottage.com/. I was the featured Cottage of the Month for September 2006, but this time it is a Halloween extravaganza!! You will be able to see much more Halloween in my house. (with much better photographs) She has a really great camera, and a great eye for photos. I had such a fun time on Monday, when Jennifer was here taking the pictures. Be sure to check out her site on October 1. If you haven't been to her site before, she has amazing items for sale, as well as beautiful Cottage of the Months to go crazy over. I believe Lisa of Pink Paint and Roses was her very first Cottage of the Month. Lisa's house is really cute!!! Every first of the month a new cottage/home is featured on Jennifer's website. I hope you all have a great Fall weekend!!! I will be heading out to the Ventura Flea Market on Sunday. (The first one since June) YAY!!! What I Did With Those Yard Sale Finds!! In my last post, you saw the items I picked up from a great Friday yard sale. Here is what I did with them. I put a pumpkin under the trellis and tied an orange and black ribbon on top. The cute wire stand did not come from the yard sale. I stopped at Home Goods on the way home and picked it up. I thought it was so cute I couldn't resist. Here is the little green and white bird house. I hung it outside my kitchen window. That rusty old $1 shovel got some pretty leaves and ribbon tied around it for a new look. My home is fully decorated for Halloween now, so in the coming days you will be seeing a lot more. A Fun Sale on Friday!! A couple of days ago, I found out about what sounded like a promising backyard sale. My daughter Amanda works for one of our local newspapers, and she always lets me know if a sale sounds like something her mom would want to see. I went to Yahoo driving directions and mapped it out. 20 minutes from my house, not too bad. I got up early, and headed out to the sale. When I arrived, it turned out the sale was being held by some of the ladies, I normally buy from at the Ventura flea market. They are all really nice and have some great stuff. I ended up buying a lot of smaller items, but there were great pieces of furniture and garden pieces too. I thought you might like to see what I bought. I got the cute little bird house for $5, and the Halloween decoration for $5 as well. The cute little red chair was $15, and the practice typing book was $1. I thought I could use the old pages as background for my artwork. The typing book is from 1949. The rusty shovel was $1. The rustic trellis was also only $5. I have been wanting one, but they are usually a lot more expensive. The 2 pillow covers were $5 each, and are practically brand new from Pottery Barn. The angel is carved wood and was, guess again $5. The antique candy jar was $7. I had a great time looking at everything, and buying my treasures. (My husband calls them new toys) I hope you all had a fun Friday too. I have been thinking about Halloween lately, while getting my house decorated for the season. This is my husband Mark, and this is our view. It was beautiful!! Mark played some golf on their lovely course. This particular hotel is just a lovely, pampering, enjoyable experience. One of the things that Half Moon Bay is known for is, the giant pumpkin contest in mid to late October. We took a little drive to see the winning pumpkin. It was something crazy, like 1200 lbs. That's me standing next to one of the giants!! The picture that you see of the French chateau is a bed and breakfast inn that we also stayed in on this trip. It is in Moss Beach, which was just up the road from Half Moon Bay. We had a great time there as well. Here is another view of the Ritz. This is me standing at the entrance to to hotel. They have it decorated beautifully for the Fall. I'm sure by now you have heard me talk about my very favorite shop in Ventura, Garden Memories. I was up there today, and Barbara the owner was nice enough to let me take photos of her lovely shop. She has the most fun, cute, different, charming, whimsical, and just plain wonderful items. Barbara has a really good eye, and she has a way with merchandising just right. I can go into her shop every week and find something new. It is never old or boring. She changes it often. This is where the owl in my last post came from. Here is another Halloween owl, just like the one I purchased last week. Today I bought some Halloween garland that you can see above. It is silver mercury type glass with black and orange stars. (I love it)!!! Look at her wonderful ribbon selection. It is so hard to resist. I hope you enjoyed this little tour of Garden Memories. Maybe you can visit sometime.